Alex Durk in Music on 5 September, 2014. I’m going to preface this review with a pointed note. 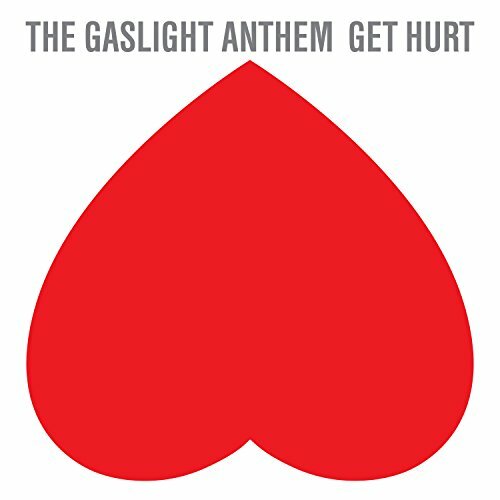 If I’m a fanboy of any one band, it’s of The Gaslight Anthem, hereafter almost always referred to as Gaslight because life’s too damn short for repeatedly typing out long band names. Go figure. over that comparison, but I will say one thing – Gaslight have changed. And not necessarily in the ways you’d expect. But let’s start with what’s not changed. It’s still the same band, the same four members. And there’s still a punk core. It’s perhaps most noticeable in the first single, “Rollin’ and Tumblin’”, a sub-three-minute slice of hard and fast rock that could conceivably have fit on any one of their previous albums. The run time reflects that too – the album proper only has two songs that top the four-minute mark, and even those could hardly be described as lengthy. come into a much more prominent focus on this record – witness the huge, grungey, Pearl Jam-esque riff on “Stay Vicious” and the synth stylings of “Underneath the Ground”. Lyrically there’s been a shake-up too. Fallon has said he consciously tried to avoid some of the words that have been hallmarks of his writing for Gaslight beforehand, and the radio seems to have died with Maria and the Ferris wheels. Yet there’s so much more that’s gone – the sense of optimism that pervaded much of Gaslight’s earlier work is also noticeably absent, replaced by a dark futility and, ultimately, misery. Knowing the circumstances behind the album’s writing – Fallon very recently finalised the divorce from his wife of ten years – this should not be too surprising, but it somehow still is. It may be a divorce album, albeit one more concerned with understanding misery than unforgiving anger, but it’s still a shock to hear lines like “If I thought it would help, I would drive my car into the sea/If the fire and smoke and explosions could speak for me” from Fallon’s lips. That’s not to say that this is a particularly dark record musically. The stand out track “Helter Skeleton” and the album’s closer “Dark Places”, from which the above lines are lifted and which acts almost as a companion piece to “The Backseat” from The ’59 Sound, both romp along in a major key, trying and succeeding to fight through the gloom of their lyrics. There’s plenty more upbeat music over the album, even if it’s in stark contrast to the lyrics at times. But there’s also plenty of slower, softer, more reflective points. And that really is a change – previously Gaslight songs have either been loud or soft. They haven’t before embraced the possibilities of varied dynamics over a single song, and it’s refreshing to hear it here. And yet, that brings me to my one major criticism of the album. Having discovered that they can write and play songs that are both loud and quiet, the band have overdone it. I would argue that at least four of the songs on the album rely heavily on this structure to succeed – and individually, they do succeed. But it comes at the price of letting the album as a whole feel a little too formulaic structurally, even though the soft sections are at different points in the four tracks. Dropping one would have been better – as it is, it’s far too tempting to think “Okay, I’ve heard them do this now” by the end of the album. However, let’s not be too harsh. This is still a good album. It’s well produced, very well sequenced, lyrically fantastic and full of solid band performances. Lead guitarist Alex Rosamilia in particular is in good form, laying down some great guitar work, seemingly playing with a greater freedom now that he’s not having to knock out a solo on every single song like he did on Handwritten. The odd slight misstep notwithstanding (I’m looking at you “Underneath the Ground”), each track holds its own against the rest of Gaslight’s discography. And in the end, can you ask for much more from an album? Oh yeah. Good cover art. But we’ll let that slide for the moment. end of the album, Get Hurt is not any less complete without them. And frankly, they just don’t fit with the album. Which is not to say they’re not good songs. “Mama’s Boys” and “Sweet Morphine” both have obvious country influences whilst showing a lyrical complexity pretty foreign to that genre. “Halloween” is already well known to the band’s fans, and its greater exposure here can only be a good thing. The final bonus track, unfortunately an iTunes exclusive, is “Have Mercy”, and it is the only one which might have improved the album – it could have conceivably fit on the album as a replacement for the other ballad, “Break Your Heart”. But with that switch, the sequencing would have needed changing, as “Have Mercy” is most definitely an album closer. And, ultimately, with so little to choose between the two ballads, I prefer closing with “Dark Places”.